The beaches of Alt Empordà, we find them if we follow the descending from the Cap de Creus to the south of Catalonia. Also historically it has been a zone of war, and a treasure from the standpoint of fishing and merchant sea what you mean. Here we found overexploited zones for tourism zones, and you can find real postcard corners. The first area we find is the one of Monjoi, where you will find some virgin coves, and that tourists have not discovered yet. In one of the coves of Montjoi, stood, until its recent closure, which has been for years the world's largest restaurant El Bulli. In Roses, begin to find beaches with fine white sand and more expensive services to tourists, as well as numerous activities related to the sea. They are perfect for a bath, if the weather is and not blow "Tramuntana" (strong winds from the north). In the next section we find the Parc Natural del Aigüamolls the Empordà, where is located the large development of Empuriabrava, which put in serious troubles to Natural Park, is an area of high mass tourism and tourist exploitation, if we move a little we'll find here nice and quiet beaches. In Sant Pere Pescador, we find one of the longest beaches of the Costa Brava, two kilometers of beach, from the river Fluvia mouth the vicinity of Sant Martí d'Empurias. The village has a total of seven kilometers of beach. It is a perfect place to practice sports that have to do with wind, you will find numerous sites that offer their activities, especially windsurfing. On the last stretch of beaches of the Alt Empordà, we find l'Escala, formerly a small fishing village, today, despite having increased its population, has managed to retain its charm. Here we find vast sections stretches of sandy beach, with some rock. The waters are especially clear, if we want to delve into the interior of some of these must hacerlon with caution as water in some sections of the interior are especially rocky. 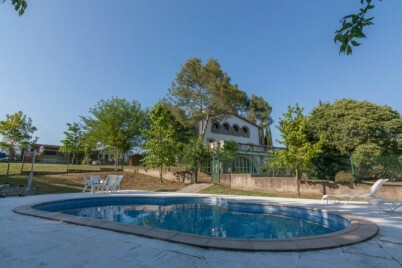 Cottage in the heart of Garrotxa ideal for groups. Billiards, large lounge, large rooms and large garden with pool and barbecue. 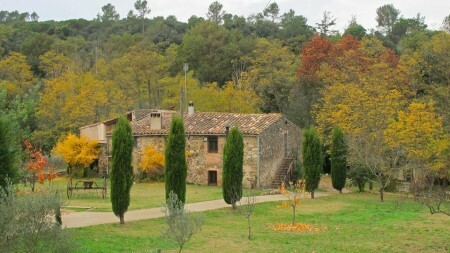 Rural house located between Girona and the Costa Brava. Ideal to unwind and enjoy the scenery.